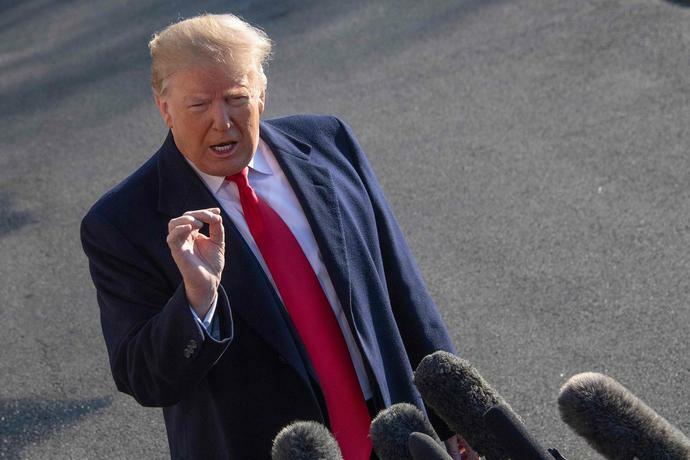 Both mocking and denouncing news reports that the FBI has investigated him for being under Russian influence, President Donald Trump found himself denying Monday that he has ever been under Russia's thumb. "I never worked for Russia," Trump told reporters as he departed the White House en route to an agriculture speech in New Orleans, adding that the question itself was "disgraceful." Earlier, citing a Fox News report on lower gas prices being the result of more oil production, the president tweeted: "But this is bad news for Russia, why would President Trump do such a thing? Thought he worked for Kremlin?" Trump's tweet came days after The New York Times reported that the FBI had begun a counter-intelligence investigation on Trump to see if he had been influenced by Russia when he fired FBI Director James Comey in 2017. The Washington Post then reported that Trump has concealed many of the details of his conversations with Russian President Vladimir Putin, even from aides and U.S. intelligence officials. Asked about a report that he had seized notes from his interpreter after the Putin meeting, Trump called it "fake news." Special counsel Robert Mueller is investigating Russian efforts to influence the 2016 presidential election, and whether the Trump campaign was somehow involved. Trump has denounced the Mueller investigation as a "witch hunt," and has constantly attacked media coverage of it. Over the weekend, Fox News host and Trump supporter Jeanine Pirro, asked Trump: "Are you now or have you ever worked for Russia, Mr. President?" Trump replied: "I think it's the most insulting thing I've ever been asked. I think it's the most insulting article I've ever had written. And if you read the article, you'd see that they found absolutely nothing."